The jewelry sector is one of the sectors with the greatest ambition to make its mark as a global brand. Representatives of the industry have declared their goal of becoming the global leader by reaching exports of $10 billion in 10 years. Turkish companies are known for their traditional way of doing business (store based) in the U.S., but one of them decided to set up a web based company. (http://www.mygoldgram.com) Çiğdem Bostan, Vice President & COO of Halach Gold Inc., a New York based gold buying and selling company, talked to TURKOFAMERICA. Turkish companies are known by their traditional way of doing business (store based). Why did you decide to set up a web based company? We wanted to set up a business model which is appropriate for this market. When the company started its operations in early 2009, gold was trading at an all time high. And to reach out to the maximum audience, opening a web based company was most appropriate. Can you give us some information regarding your progress since the launch of the website? Our business has been growing in leaps and bounds. When we started, we were trading gold from individuals. But we realized that there was a huge potential in selling gold to institutions and buying scrap from gold dealers. Hence we capitalized on that opportunity which gave us an immense surge in our volume. Can you give us some information that is related to the American Market- specifically trading gold online? There are so many web-sites that sell gold bullion and/or ask you to mail your scrap and broken jewelry. Just like in any transaction. people have to be more careful who they are conducting business with. When purchasing gold bullion you have to make sure that you are paying the least premium on top of the gold price and if you decide to recycle/sell your broken jewelry you have to make sure that you are getting paid fairly. Through our blogs, websites and online live chat services we answer our customers’ questions. 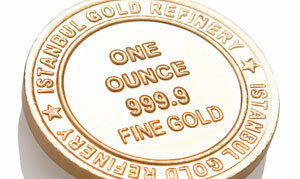 Just a little hint; Check for those website that show their price per gold karat by gram or pennyweight. How can people trust such websites? What are the precautions that are taken in order to provide secure/trustworthy online service? One way to check if the website is trustworthy or not is to check whether the business is registered with industry welfare organizations like JBT, BBB, ICTA and D&B, etc. Checking out the company with the Better Business Bureau and the city or state department of consumer affairs will only get you so far. A good indicator of a legitimate company is the quality of their customer service. Did they contact you right away? Did they give you price information over the phone? Test the company, send one item or purchase a small quantity, and if you are satisfied with the price and service, then why not do more business transactions? Also customer testimonials are so important. How is American culture based on spending? Since the earliest indications of stock market trouble, the value of gold has risen dramatically. This has changed the approach of the general public toward gold. Gold has hit the mainstream and more and more people are considering including gold in their portfolios. This current economic crisis has given a reverse spin on the American culture of consumerism. We believe, as they do, that the price of gold will continue to climb. It has the potential to protect your finances against inflation, deflation, stock market slumps, and currency devaluation. The price of gold fluctuates with the world markets, but gold will always retain its inherent value.